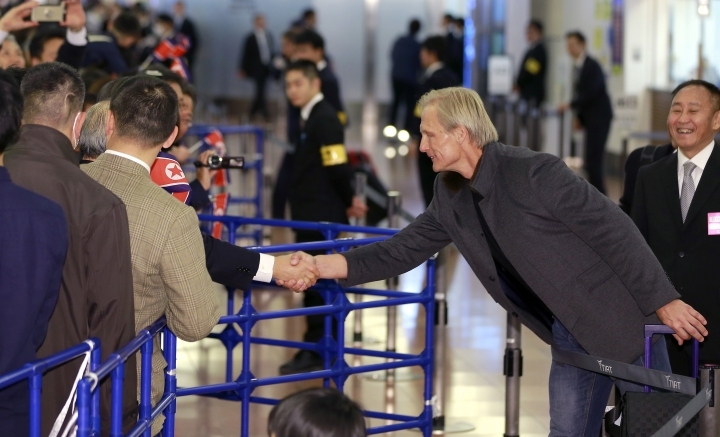 TOKYO — North Korea's national soccer teams arrived in Tokyo on Tuesday as an exception to Japanese sanctions against Pyongyang's missile and nuclear development. North Korea is competing against Japan, China and South Korea in the E-1 Football Championship, which starts Friday. After a lengthy immigration process at Haneda international airport, the women's team members, each wearing a matching red coat, were the first ones to be warmly welcomed by pro-Pyongyang ethnic Koreans living in Japan. The Korean residents cheered and waved Korean flags. About half an hour later, the men's team appeared in front of them, smiling and waving at the cheering crowd. The arrival of North Korea's men's and women's teams comes amid growing tension in the region. Pyongyang test-launched an intercontinental ballistic missile that landed within Japan's 200-nautical mile exclusive economic zone, which experts said could hit Washington if launched on a standard trajectory. The U.S. and South Korean militaries are holding a major air force exercise. Japan has banned North Korean nationals from entering the country as part of its sanctions against Pyongyang's nuclear and missile tests.